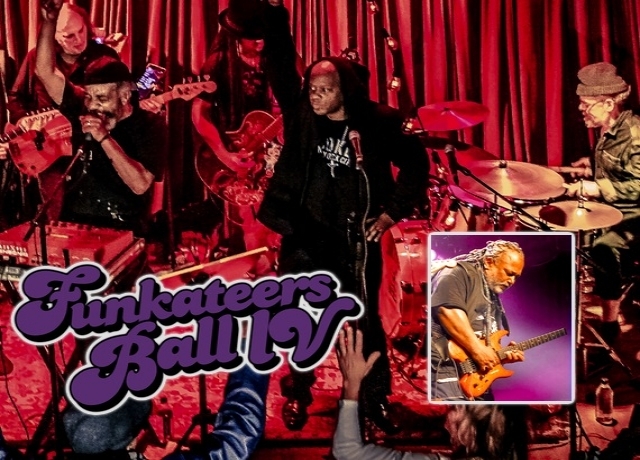 Bethesda Blues & Jazz welcomes Funkateers Ball for their fourth annual celebration featuring P-Funk legends, Clip Payne's 420 Funk Mob and guitarist Michael Hampton. Come together with fans of Parliament-Funkadelic and other legendary Funk bands for a celebration of Funk music, style and culture. Enjoy an evening of great live music and share the experience with Funkateers from the DC area and all across the nation. Wear your funkiest attire or just come as you are to join the party, feel the vibe and get down on the dance floor! Mike "Clip" Payne joined Parliament-Funkadelic in 1977 as vocalist and keyboardist on more than twenty recordings while acting as on-stage commentator during live performances. His band 420 Funk Mob features a revolving cast of former P-Funk band members and other legendary performers along with up and coming artists. The band cuts across all musical boundaries with a blistering attack of Funk, Soul and Rock & Roll, straight up jammin' with a true mob of musicians from different genres, places and eras united by their dedication to the groove! Michael Hampton, legendary lead guitarist with Parliament-Funkadelic, joined the band in 1974 fresh out of high school after impressing George Clinton with his rendition of "Maggot Brain" which became his signature song in live performances. Known as "Kidd Funkadelic", Hampton became a star known for his spectacular guitar licks and memorable solos on P-Funk's famous live tours and on many of the band's greatest recordings. As a solo artist today, Hampton is still thrilling audiences with his virtuoso performances on his own shows and with other bands. Please note: There is a $20 food/beverage minimum per person not included in ticket price. You are buying tickets that are not refundable or exchangeable. Please review our additional purchase policies.